I searched the internet and Pinterest for hot air balloon party ideas and came across a lot of fun stuff. I found a site that made hot air balloons out of paper lanterns. 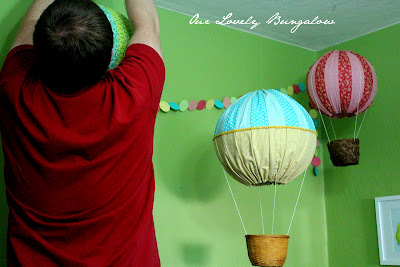 Since we used quite a few paper lanterns for our backyard wedding that were sitting in the shed just waiting for another use I already had the basis for our hot air balloons. 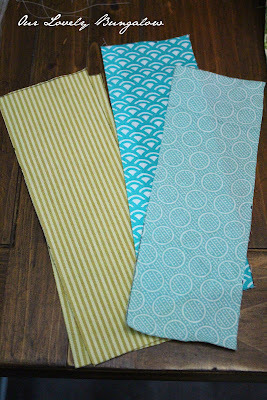 I found some fabric in the colors I was using for the party and got to work sewing the balloons together. 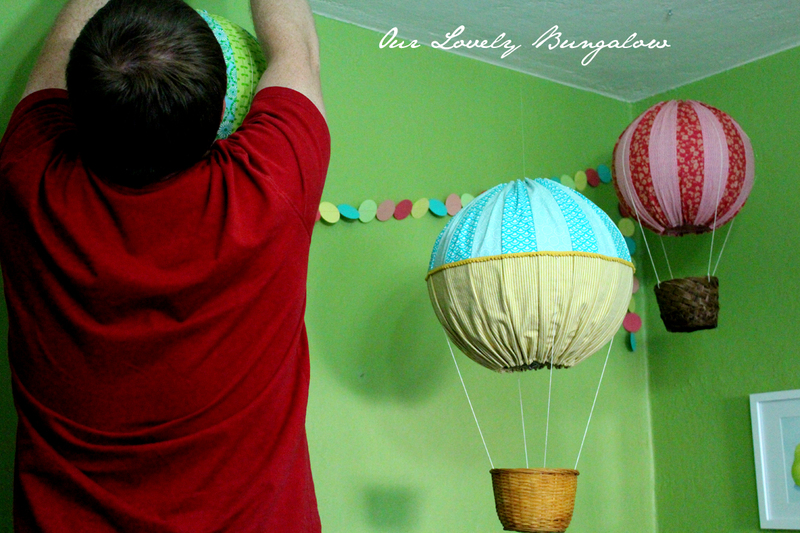 I decided to make three hot air balloons with one larger balloon and two slightly smaller ones. 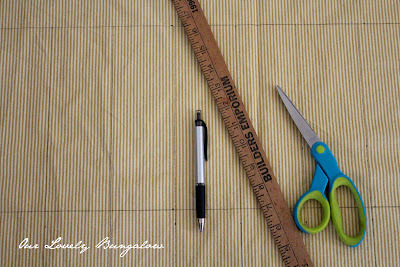 I first measured the circumference and height of the paper lanterns to determine the number and length of fabric strips needed. 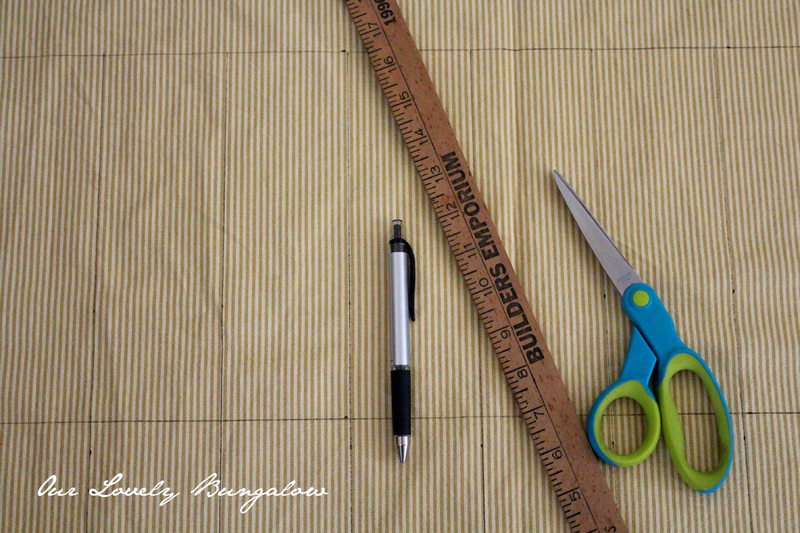 I then measured and cut strips of fabric including enough extra for seams. For the larger balloon I decided to try to imitate the design above so I cut strips to cover half the height of the balloon in different colors. 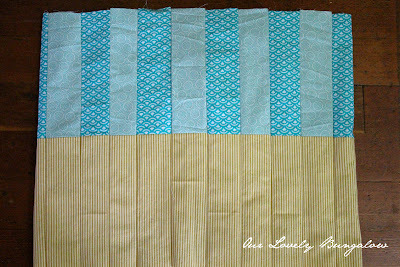 For the other two balloons I measured the strips to cover the length of the entire lantern. 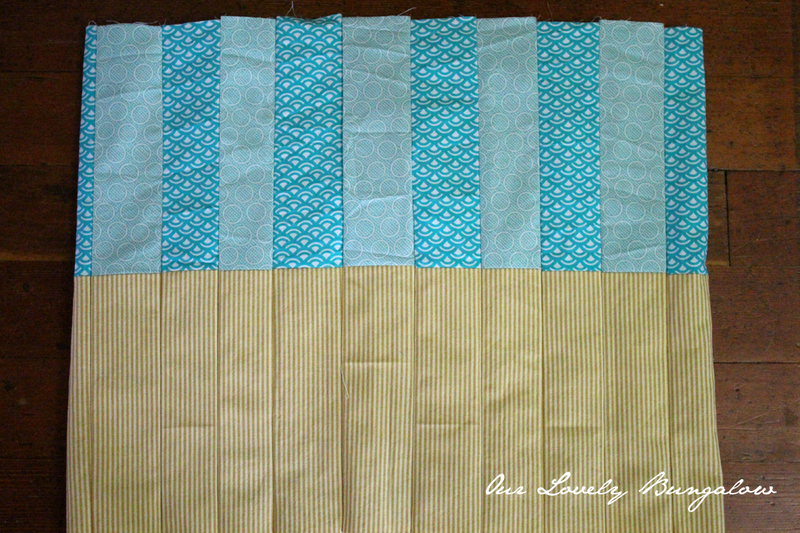 I meant to use the top and bottom hems as channels to pass a string through to be used to gather in the ends, but that proved difficult. The plastic needle I was using to shuttle the string through the channel would get caught at each seam where the fabric folded back on itself and snapped at one point when I was trying to work it through. 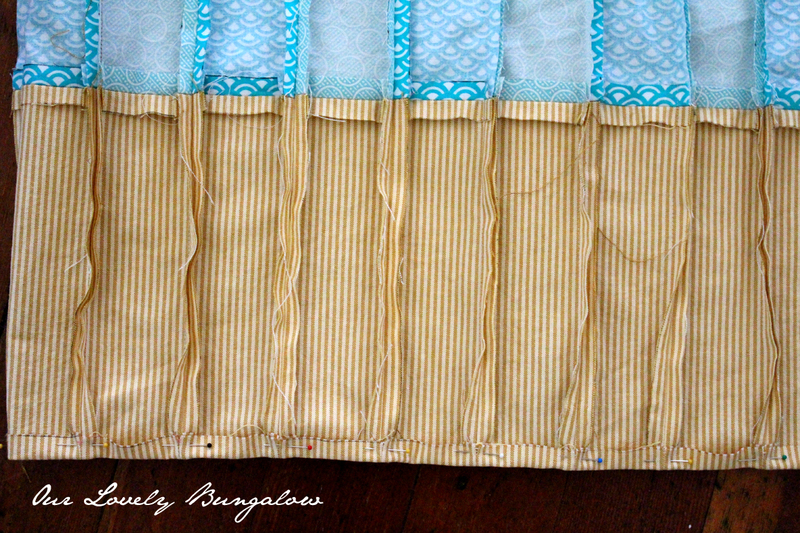 So I ended up loosely handstitching a string through the hems for gathering. Then I slipped the fabric over the paper lantern and pulled the gathering stitches tight at both poles. Next I hung a small basket removed of it's handle using twine. It took a little bit of work to get it level. 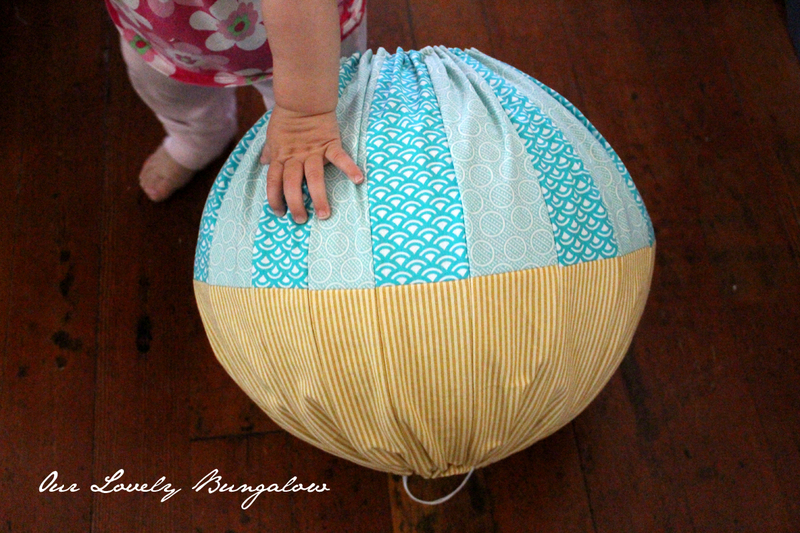 I also added decorative ribbon along the center seam of the large balloon. Brian then helped me hang the finished balloons. Or more like he hung them while I called out directions, "a little to the left, no too far, back a little". 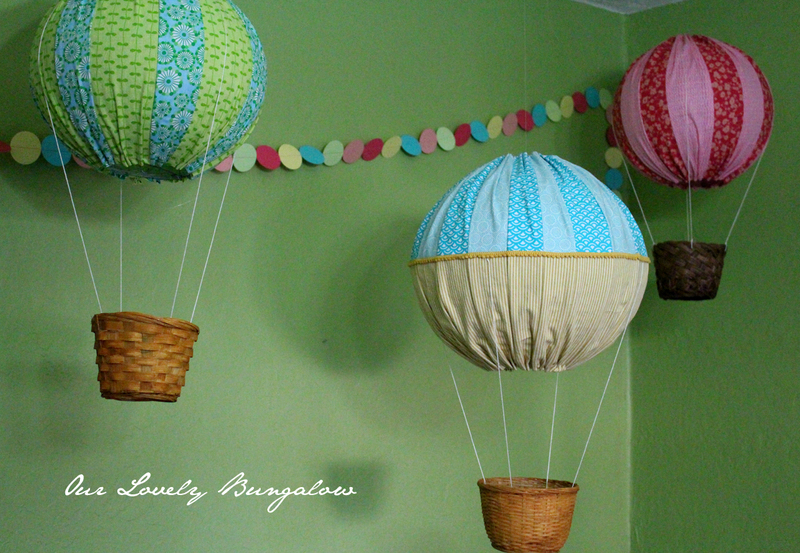 Thanks Linda, your blog was JUST what I needed I am hosting a baby shower and was looking for decorations for their "Hot Air Balloon" nursery theme. When I found this blog, I knew I could make a few for Shower decorations, that could then be used in their nursery. They turned out great. 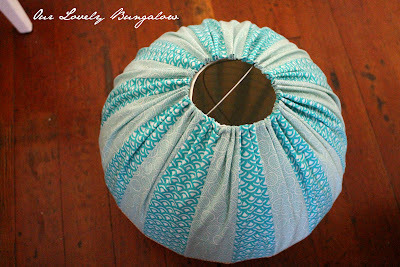 FYI, I ran twine through my hem on each end as I sewed it, then just cinched closed and knotted after I put it over the lantern. Worked great. 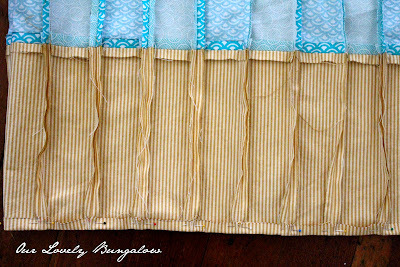 Good idea about running the twine through the hem while sewing it! 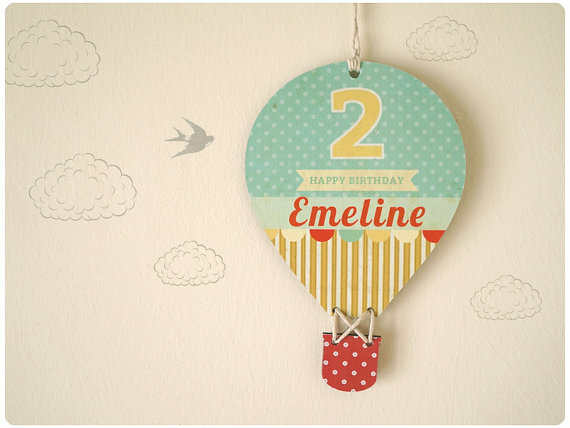 Birthday party decoration is incomplete without balloons and cake. These two are most important factor of a birthday party. I like them a lot. When i was a child i use to tell my mom to bring lot of balloons on my birthday. My parents celebrated my every birthday with lot of joy and excitement. It was a very special day for all of them. I still remember all those days and they are very special part of my life. 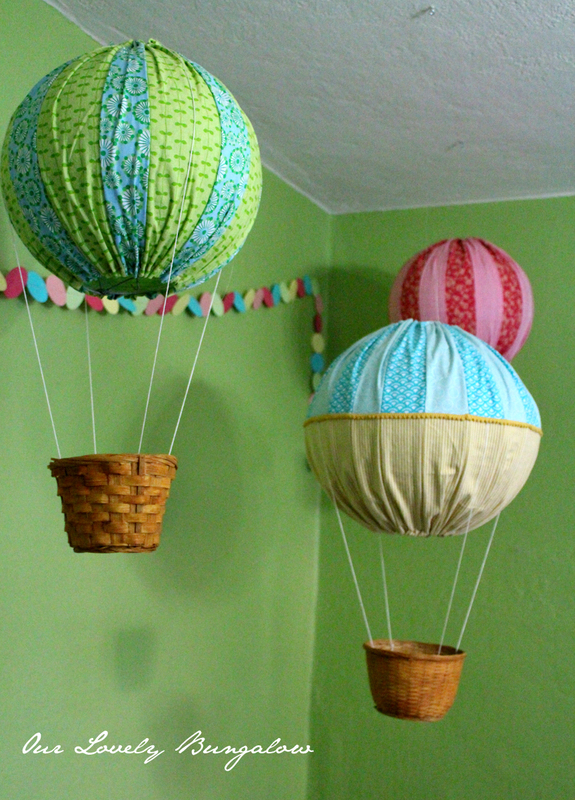 The idea above of making hot air balloons is very creative and different. They are looking wonderful. Where did you find the baskets? I just found the baskets at a thrift store. Thanks for stopping by!